It’s easy to look at skateboard wheels and think they all work the same. After all, all they do is roll, right? Whilst that is true, skateboard wheels actually have different properties. By tweaking these properties, wheel companies can make their products work really well for different environments. As such, today I’ll be introducing you to the best wheels for skating in the streets. These wheels are built to handle the different terrain you’ll find in your city and can go along the way to improve your skate experience. These Spitfire wheels are fast becoming modern classics, it’s hard to miss seeing a set at the skatepark or on most skateboards these days. They come in various sizes, starting from 50mm up to 60mm in diameter. They also have two main wheel durometers with a 99a blue wheel option or a 101a red wheel option. The softer 99a wheel will work better for asphalt and sidewalks. Because it is softer, it will absorb a bit more road vibration and make it more comfortable to skate over unsmooth surfaces. The 101a wheel will be easier to push and will roll faster though it will reflect more road vibration. This version is better suited to smooth surfaces like those in skate parks, I wouldn’t recommend it for the streets. The wheels are rather hard at 99a and 101a, this limits their ability to absorb road vibration. You’ll get a lot of feedback from the road if you go with these. If you want wheels that will feel a bit smoother, I recommend the Ricta clouds. The 50mm versions of this wheel are too small. This small diameter limits them from rolling smoothly, but if you have low skateboard trucks and hate wheelbite those are the one for you. I recommend most people go for the 55mm versions for better all-round performance. You can check these wheels out here on Amazon.com. A bit bigger than the Spitfire wheels, the Ricta clouds come in a variety of sizes from 50mm to 60mm. They have a variety of durometer options and have a soft 78a wheel available, much lower than any of the other wheels on the list. The other options are 86a and 92a wheels. The combined height and softness make them the most ideal wheels for environments outside of the skatepark. The softness absorbs road vibration and makes the ride comfortable, whilst the 60mm maximum diameter smoothes out the ride and allows the wheel to roll over cracks easy. If you want the most comfortable ride experience, you should check out longboard wheels. Click the link to learn more about longboard wheels. However, with big wheels like this, it is recommended you have hi-trucks, use riser pads or tighten up your trucks to avoid wheelbite. The tall wheels are also a bit heavier so they won’t be the best for flip tricks, 50-50s, and ollies. The softer versions of the wheel will be a bit harder to power slide and will flat spot easily if you slide them at 90 degrees, so I would only recommend the softest versions to slightly advanced riders and not to complete beginners. That said, with so many choices, you can pick the features that best suit your style and requirements. I would recommend the 55mm tall, 86a wheel as an all-round option for all terrains. You can check them out on Amazon.com here. The most affordable wheels on my list. The Mini logo wheels come in sizes between 52mm-54mm in diameter, with a larger 58mm option. All their wheels are a standard 101a durometer but come in a wide variety of colors. The large 58mm option is the best for riding over asphalt. This large diameter allows for the wheel to roll smoother over uneven terrain. However, combined with the 101a urethane, this wheel will reflect a ton of road vibration so the ride won’t be very comfortable. For a more comfortable wheel, check out the Spitfire or the Ricta if comfort is your main priority. That said, if you don’t mind the ride, I would recommend these to you especially if you’re on a budget, if you’ll spend most of your time in a skatepark, and if your city has relatively smooth sidewalks and roads. The most expensive wheels on my list. Bones (a subsidiary of Powell-Peralta wheels) as a company goes a long way in testing and designing their wheels. This is reflected in the quality of their wheels (and in the price hehe), and why they are regarded as one of the best skate wheel companies. These wheels are 56mm tall and are made with the proprietary SPF (Skatepark formula) by Bones. They come in at 84b (or 104a) hardness but act differently to your common 104a wheel. The SPF urethane allows the wheel to be hard, but to grip well. Any other wheel this hard will tend to slide out if you turn too aggressively, this one has more grip and will not. This feature makes them best skateboard wheels for concrete parks as you get a really fast rolling wheel that has good grip. 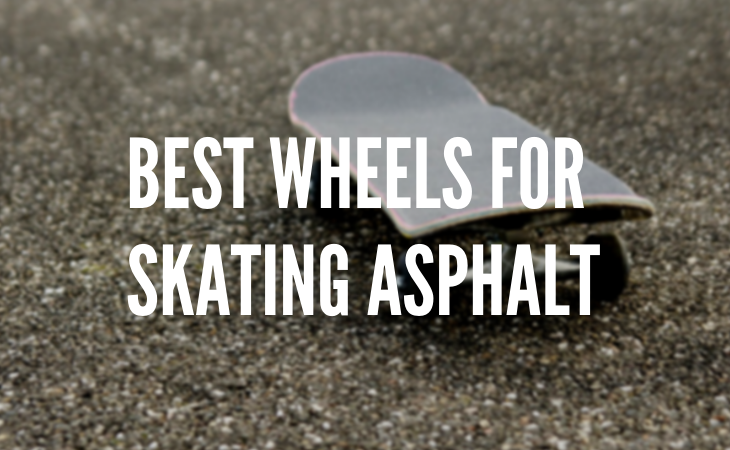 That said, they aren’t that good for use outside the skatepark on asphalt, specifically because of their hardness. This hardness means they won’t absorb road vibration that well and will give an uncomfortable ride. For something smoother check out the Ricta Clouds or the Spitfire. Finally, these wheels also come with free Super Reds bearings, so if you’re setting up a board they are a good option. Check them out here on Amazon.com. Which wheel should you go for? Whilst your choice lines up to your situation, budget, and personal preference, I think that the Ricta cloud wheels are the best on the list, specifically their 86a, 55mm option. The wheel is tall enough to provide a smooth ride and soft enough to provide some vibration dampening, a true all round wheel. You also have options to pick different hardnesses and diameters according to your preference. Having wheels that you can use at the skatepark and outside makes your skateboard versatile. You’re no longer limited by the park and can tackle urban obstacles across the city. You’d even be able to enjoy cruising a bit more.